Despite a century having passed since the signing of the Armistice, the scale of the legacy of unexploded ammunition from The Great War is still a little known fact. Recovering The Past is a photographic documentary project of 25 striking and thought provoking images produced to coincide with an exhibition in Ypres, Belgium. This book contains all the images from the exhibition and describes how they came about in technical detail and the backstory behind each image. It also comes with six postcards selected by the photographer Ian Alderman. It examines the operations of the Belgian Army’s bomb disposal unit (DOVO-SEDEE), whilst drawing its artistic inspiration from Australian cultural icons to commemorate the Australian Imperial Force’s (AIF) significant contribution to the fighting in Flanders. The role of the British Army in the battles of Flanders is widely appreciated, yet the role of the AIF to that fighting and the eventual Allied victory remains lesser known. The sacrifice and heroism of Australian soldiers in Belgium was as intense as that endured in France and at Gallipoli. 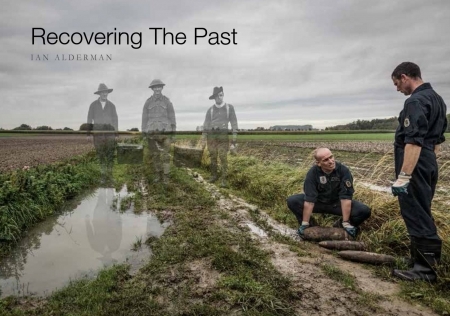 Through sensitive compositing of both historic and modern photographs, Recovering The Past visually acknowledges Australia’s ‘Diggers’ in the successful outcome of the war in Flanders.